A couple of weeks ago some of Residence went on a trip to Glasgow to visit the brilliant Buzzcut, a performance festival now in its second year. We found a very welcoming atmosphere and the sense of a thriving artistic community. We were invited to a meeting with the aim of bringing artist-led ventures around the country together, to share the fact that we exist, talk about the ways in which we work, and to see what we can learn from each other – are our challenges and successes similar? 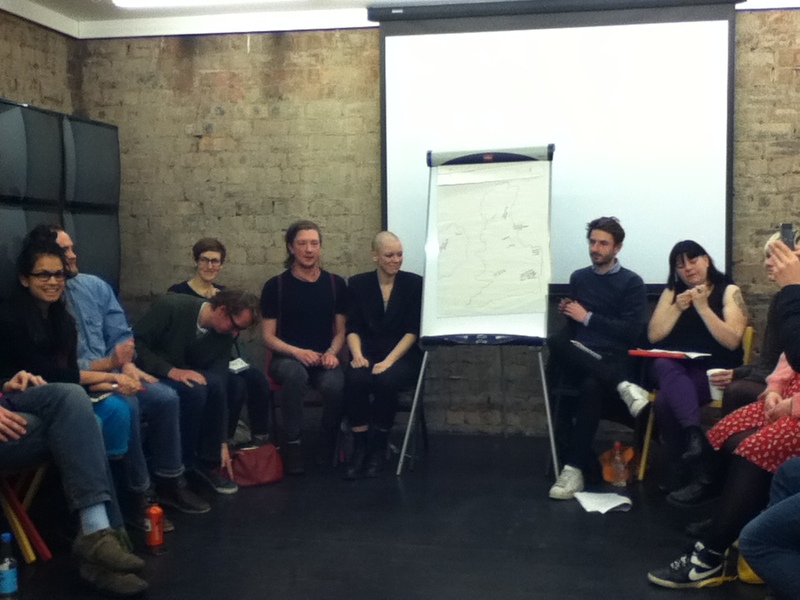 Present at the meeting were people from groups and artist-led communities all around the country – including Performance Space, Be Beyond, Forest Fringe, Forest Cafe, Hatch, Bellyflop Magazine, Show Time, Parlour Showroom and others. Although we only had a short time, it felt valuable and inspiring to us to get a sense of the scale and variety of projects happening around the country, that are in some sense ‘artist-led’ and independent from institutions. We’re going to find ways to keep in touch and hope to find space to meet up again, to perhaps find ways that we can develop support networks and become more connected.